To Make White Catchup Mrs Swire Boil 1 lb of anchovies in a quart of vinegar very gently for a quarter of an hour, then strain it through a sieve. peel 1 lb of Eschallots, & boil them in a quarter of mediera, [vidonia?] or Sherry with a 1/4 of an ounce of mace the same quantity of white pepper when a little boiled mix it well with vinegar and bottle it when quite cold with spice. NB It is good in [patties?]. Black Currant Biscuits Mrs [Swire?] 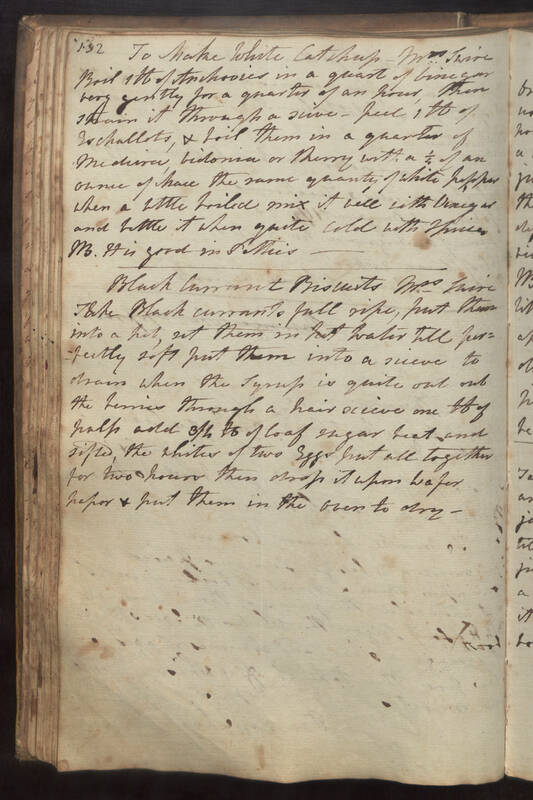 Take Black currants full ripe, put them into a pot, set them in hot water till perfectly soft put them into a sieve to drain when the syrup is quite out rub the berries through a hair seieve one lb of pulp add 3/4 lb of loaf sugar beat and sifted, the whites of two eggs put all together for two hours then drop it upon wafer paper & put them in the oven to dry.